Prakash Raj, a famous South Indian actor has become the darling of the leftist media and commentariat because of consistent attack on Prime Minister Narendra Modi of late. He has been vocal after the death of his friend Gowri Lankesh, a communist activist who was killed by unknown assailants last year, but the leftists blamed the murder on ‘right wing’ groups without any proof. 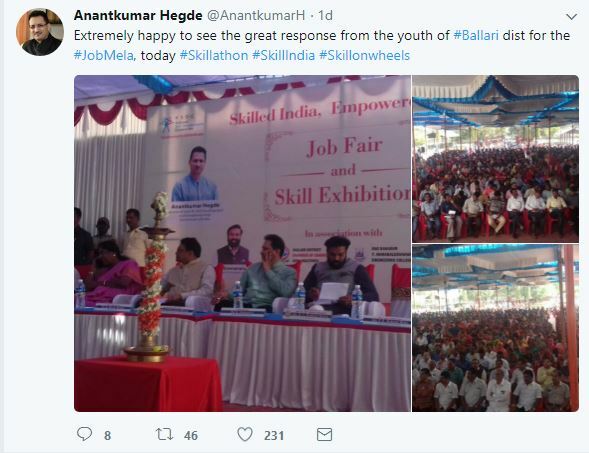 The minister was speaking at a job mela in Ballari district of Karnataka. There were a few protestors at the venue who were protesting against his remark at the constitution. We had argued why the controversy surrounding the constitution was a farce in our earlier report. The media claims that these protesters were Dalits. The protestors blocked his vehicle and shouted slogans against him according to media reports. “Only the strong are respected. The weak are not respected by their pet dogs as well. We are stubborn about the goal of awakening and empowering the youth of the country. We will not bother about barking stray dogs. I am not here to make jokes. I don’t care if people distort my comments, but I will tell things as they are. I can’t compromise regarding that. Though the minister might have taken a potshot against protesters, he clearly did not use the words “Dalits are dogs”. And there is no proof to say that all protesters at the venue were Dalits as claimed by Raj. In fact, media reports say that the protesters included farmer, labour and women organisations besides dalit organisations. This episode is reminiscent of the time when PM Modi, in an interview had used a metaphor to convey his thoughts. He had said that when even a small puppy comes under the wheels of a car, the person in the back seat also feels bad, then how will he not feel sorry for the victims of the Gujarat riots. This statement was twisted by the opposition and the media as insensitive. “Barking dogs” is a popular phrase in various languages and is used to refer to people who just are vocal and combative but are not constructive or brave e.g. “barking dogs seldom bite” is a popular idiom in English. To suggest that this phrase paints the entire group or every member of the group as a dog is plain distortion to further a political or ideological agenda. The media and Prakash Raj ignore the part where Hegde says that people of all castes and parties have to be engaged in nation building. Like his fellow comrades, Prakash Raj too is slowly deep diving into the practice of using half-truths and whole lies to gain a political mileage. Last month too, he was caught spreading fake news using his social media account. We can expect even more such lies from him as the Karnataka elections approach.